Here we have the NicMachine 1. 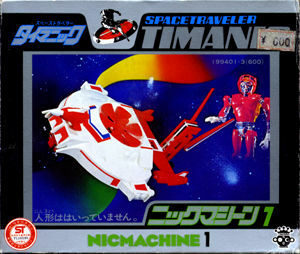 The NicMachine 1 is one of two vehicles designed for the Red Timanic figure. Despite it's small size in comparison to the actual figure, the figure does fit in it, as shown below! Both NicMachines sport a rocket launcher and a plastic encased metal girder system that makes the vehicles somewhat interchangeable and also serves to hold the figures in place via magnetism. Another little oddity about the NicMachines is that they both utilize small black wheels with wire rod axles. These wheels are basically just larger versions of Hot Wheels wheels, and just about as sturdy! Which is to say, not very! The NicMachine 1 is basically a flying saucer-like ship with a rotating fan in the center. 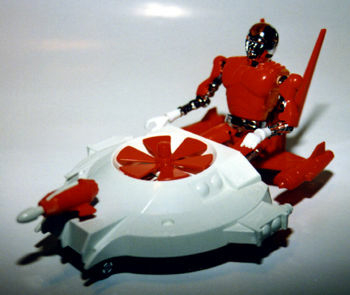 The rocket launcher is identical to the rocket launcher found on the Microman Gyro vehicle.